The roads were deserted. No children were playing outside. Some women, who were talking on a house porch, suddenly went silent upon spotting a passing stranger. Tension was still in the air after a clash broke out between members of more than five Muslim groups and Islamic sect Jamaah Ahmadiyah on Thursday in Manis Lor village, Kuningan regency, in West Java. Most residents still preferred to stay in their homes in the village, home to the country’s biggest Ahmadiyah following, which was established in 1954. Of the village’s 4,350 residents, 3,000 belong to the sect. In and around the village, some policeofficers, including several in plainclothes, were on the lookout. On a street corner, a group of men stayed alert, with cups of coffee and scattered cigarette butts all around them. Nurahim, a 47-year-old secretary of the Jamaah Ahmadiyah Indonesia branch in Manis Lor, said they were afraid another attack would come but were relieved by the police’s presence. Last Thursday’s clash triggered panic among the sect’s followers. Many rushed home from their workplaces to check their loved ones were safe. “When I heard about the attack, I panicked. I then decided to leave work to make sure my family and other residents were safe,” said 37-year-old Syaiful, who works for a private company in Jakarta. Another Manis Lor resident, Kusworo, had to close down his shop because of the attack. “The clash affected me financially, but I had to make sure my family was safe,” said the 43-year-old trader, who sells basic foodstuffs and now has to rely on his savings to support his family. The attack has also raised concern among parents and children. A mother of two, Rosidah, was worried the attack would traumatize her children. Several children who witnessed the attack said they were afraid and others said they were having trouble sleeping. “I could not sleep that night after witnessing the fight,” said Karmilatur Rasidah, a 13-year-old seventh grader at SMP Amal Bhakti junior high school. The attack, she said, happened when she was at school. “Classes were stopped. The teacher asked us to immediately go home,” she recalled. For the Ahmadiyah followers, the attack was nothing new. Residents of Manis Lor suffered a similar attack in December 2007, in which four people were injured. 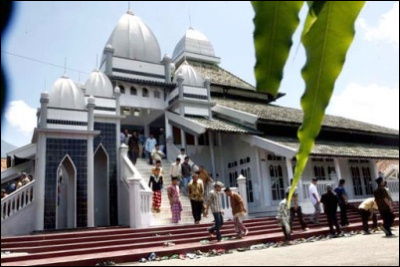 Similar attacks on the sect’s members have occurred in other places, including in West Java towns Bogor and Garut last month. The Thursday attack, which injured three and damaged scores of houses, erupted after an angry mob failed to convince the government to disband Ahmadiyah. Earlier, the regency’s public order officers, armed with a written order from the Kuningan regent, tried to seal Ahmadiyah’s eight mosques in the village, but failed. Under a 2008 joint ministerial decree, the sect’s members are allowed to perform their religious duties but are banned from propagating their teachings. The attack was soon condemned by many, with President Susilo Bambang Yudhoyono telling the police to be strict in dealing with any anarchic action. GP Anshor, the youth wing of the country’s biggest Muslim organization, Nahdlatul Ulama, announced Saturday its members were ready to protect the sect’s followers. Rosidah said she was aware there had been protests against the sect’s presence in the village.